Time flows faster far from the Earth. This prediction, made by Einstein, has been successfully tested by physicists from the Paris Observatory - PSL in the SYRTE department (Observatoire de Paris - PSL / CNRS / Sorbonne Université). Published in the December 4th 2018 issue of Physical Review Letters, the results were obtained thanks to two Galileo satellites accidentally placed in 2014 on an eccentric orbit; the accuracy of the test is 5 times better than the last test, carried out ... 40 years ago. 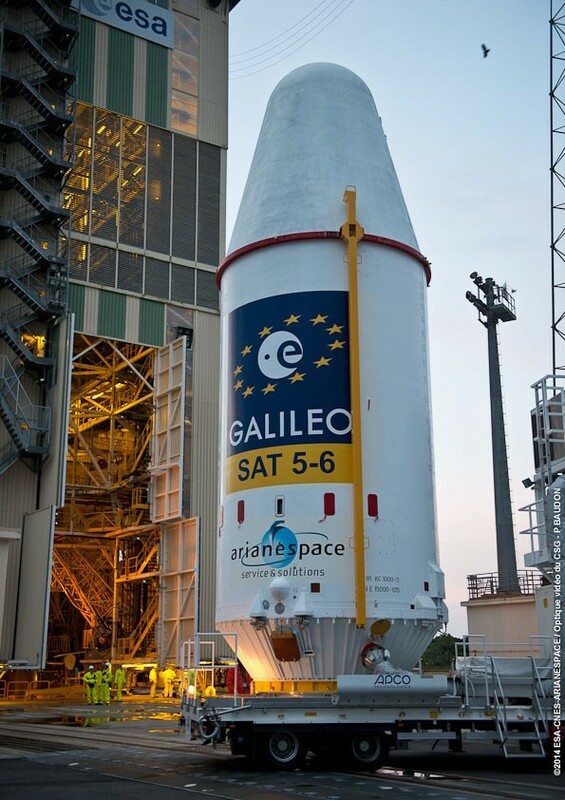 Galileo is the European satellite positioning system. There are currently 26 satellites in orbit around the Earth. Launched on August 22nd 2014 by Arianespace from Kourou (Guyana), two of the Galileo satellites, Sat-5 (Doresa) and Sat-6 (Milena), had not reached the expected circular orbit at an altitude of 23 000 km, but were on an extremely eccentric (oval) orbit with an altitude varying between 17 000 and 26 000 km. The altitude of the two eccentric Galileo satellites varies by about 9 000 km twice a day. What had at the time been seen as a failure for the European positioning system, destined to rival the American GPS, turned out to be a real gift for the physicists of the Paris Observatory, who realized that they could profit from this failure to carried out tests on the equivalence principle in Einstein’s theory of relativity. In effecgt, twice a day the satellites rise and falls 9 000 km. Each has on board an atomic clock of the "passive hydrogen maser" type (PHM),more stable than any other space based clock to date. These latter are constantly checked against the best ground based clocks via about a hundrerd ground based receivers. Starting 2015, a preliminary study  carried out by the SYRTE had shown that it was possible to use over a year’s worth of data from these two eccentric satellites to improve the test for the gravitational red shift, an experiment which had been done in 1976 by Gravity Probe A (GP-A)  and had not been done since: this is a vital test to explore the limits of Einstein’s theory of gravitation. Under the aegis of the European Space Agency, two independent parallel studies were financed in order to analyze the data from the two eccentric satellites, Sous l’égide de l’Agence Spatiale Européenne, deux études parallèles et indépendantes ont été financées pour analyser les données des deux satellites eccentriques, with the code name GREAT (Galileo gravitational Redshift Experiment with eccentric sATellites). One was made the responsibility of the SYRTE at the Paris Observatory, and the other at ZARM, at Bremen University. Following three years of data analysis, the results found by the scientists at the SYRTE and their collaborators are published in the scientific journal Physical Review Letters . They confirm the predictions of the general theory of relativity to a relative accuracy of 2.5x10-5, which constitutes an improvement by a factor of 5,6 compared to the results of GP-A. In order to understand, to evaluate and to correct the systematic errors associated with the modelling of the erroneous orbit and the on-board atomic clocks, a satellite laser telemetry compaign (SLR) was carried out during the years 2016- 2017 , by the network of the international laser telemetry network (ILRS), including the laser telemetry unit of the Observatoire de la Côte d’Azur, a partner to this project. This campaign enabled one to partially correct for systematic errors arising from orbital errors. The navigation office of the European Space Agancy, ESOC, also furnished decisive support: their experts provided accurate information on the orbit and the clock, using the best available models of the satellites, which made it possible to make a very accurate model of the non-gravitational perturbations. As far as the other systematic errors which could potentially affect the on-board clocks, wide upper limits were found using ground based tests of the clocks and on-board tests. This experiment, known as GREAT, constitutes a decisive advance, in preparation for the up-coming space experiment, ACES, expected for the opening years of 2020; in particular a cesium atomic fountain – PHARAO - will be installed on the ISS, the international space station. PHARAO should improve the accuracy of the gravitational red-shift test by an order of magnitude . P. Delva et al. « Test of the gravitational redshift with stable clocks in eccentric orbits: application to Galileo satellites 5 and 6 », Class. Quantum Grav. 32, 232003 (2015).